Some delectable pasta that you can find in a delightfully quaint golden bag, this *Whole Wheat Spaghetti is from Gentile. 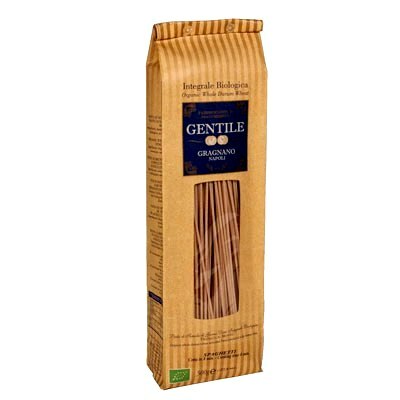 Made of organic whole durum wheat, this pasta is high in not only fiber but also other essential nutrients and minerals. It has an excellent texture and a unique earthy flavor that will go great with any of your favorite sauce. Try it with the classic tomato sauce and meatballs, savory ragu, or pesto sauce! Or if you prefer, simply toss it with butter and Parmesan cheese with a dash or pinch of pepper. Curious? Grab a golden bag today!